There are lots of things you can do with a fish net in your home. If any of your rooms have a nautical or beach theme, consider using some creative fish net decorating ideas to liven this space up. 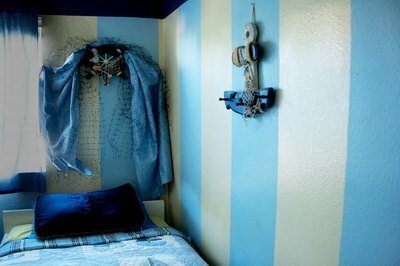 Depending on how they're used fish nets can make a great accent in any room of your home. 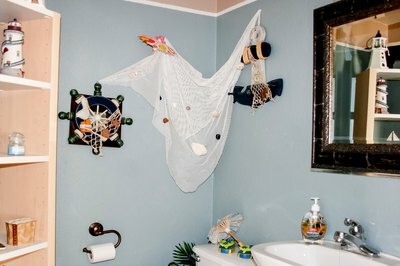 Hang a fish net on a bathroom wall that is decorated in a nautical theme. It makes great wall art. Paint the wall behind it in a sky blue or sea green. Hot glue pretty sea shells, faux star fish and fish embellishments all over the fish net. Finish by entwining silk leafy vines that resemble seaweed into the fishnet. 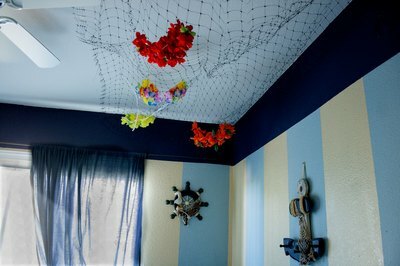 Hang a fish net from the ceiling in any room with an under-sea theme for great texture and a unique look. This looks great in a child's room, bathroom, den, living room, sun room or porch. Start at one end of the room and begin spot stapling the fish net to the ceiling with a staple gun. Allow it to swag down in some places, just don't let it hang so low that people can hit their heads on it. Drill holes into items like faux star fish, sea shells, bits of sea glass or drift wood. Hang the items with holiday ornament hooks from the net for a great ceiling treatment. Use fish net as a backdrop for your bed in place of a headboard. This makes a grand statement with great texture and it doesn't even have to look like a fish net when you're done with it. Working outdoors, spread drop cloths on an area that is larger than your fish net. Spread your fish net out over the drop cloth. Spray paint your fish net in the color of your choice. 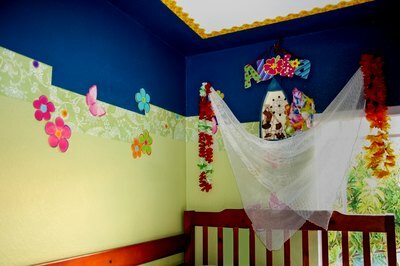 You can paint it all one color or you can spot paint it with different colors to create a mottled or muted look. Measure your fish net's height and width. Hang five hooks over your bed, spaced out evenly. Hang them high enough so that the fish net will barely brush the floor when hung. Hang the top of the net from the hooks, allowing it to swag in scallops between the hooks. Hang a large framed painting over the fish net. Alternately, you could weave silk leaves or flower garland in and out of the fish net.